Ever thought of a flower crown for your wedding? Now is the perfect time for all brides-to-be to plan their Spring 2019 wedding. 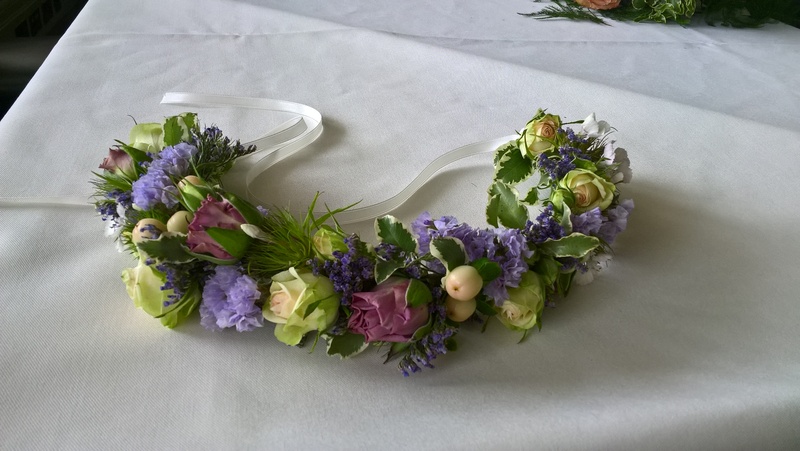 The ideal addition to a glorious wedding outfit all year round is the flower crown. One of the hottest trends on photo and idea sharing sites like Pinterest and Instagram, the flower crown can be seen adorning the heads of festival goers, celebs, or anyone who is looking to make a floral fashion statement. Nowhere though, does the flower crown look more elegant and ethereal than a wedding. More and more people are embracing colour for weddings, choosing to buck the trend of having only one or who complimentary colours with a neutral backdrop in favor of a veritable rainbow of colours. If this is the look you’re going for, a statement flower crown is a perfect addition to your wedding accessories. With a perfectly white dress or ivory dress, a variety of bold, beautiful colours makes a fabulous statement and using bright flowers which complement each other is a must. Young sunflower heads can be paired beautifully with a few bright pink ranunculus flowers to add a gorgeous display of colour. If you’re choosing more discreet decor, maybe just opting for one or two accent colours, your flower crown can make the perfect statement if you choose a few contrasting shades to match. Many couples are choosing for a tea party approach to their wedding. 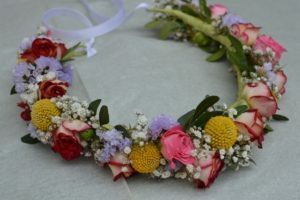 With ceremonies gravitating out of churches and stately homes towards more natural outdoor settings, a flower crown is the perfect accessory to complete this look. Choose a few delicately pastel colours to add to that fairy-tale feeling of an outdoor wedding, and pair them with darker green leaves. Peonies are perfect for a flower crown, and blossom goes with all skin tones to give the face radiance. Even the most formal weddings can benefit from a flower crown. Though the accessory lends itself perfectly to big blousy styles, the flower headdress can easily be toned down to something which adds a perfectly elegant feel. Choose small, delicate flowers such as daisies to intertwine with thin plaited leaves or even subtle metal wiring. It’s a good idea to go for a single colour if you’re looking for a minimal vibe. 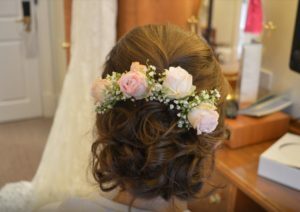 The use of rosebuds or cherry blossom flowers add the perfect feminine touch without looking over-the-top.